OXY is a modern and fully responsive OpenCart theme for any type of store, inspired by the best eCommerce solutions and designed with usability in mind. Built using the most powerful responsive Foundation Framework. It includes Admin Panel with 600+ useful features, options and settings allows you to do extreme customizations without knowing any HTML or CSS. Bestseller/Featured/Latest/Special with Slider or Grid visualization. Dynamic Logo position – Left / Center. Dynamic Search Bar position – Left / Center / Right. Home Page Link – Text / Icon (on/off options). 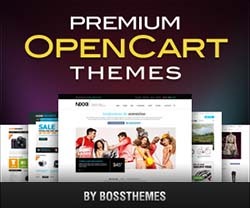 4 Categories Display Variants – Horizontal / Horizontal with Icons / Vertical / Default OpenCart Style. 3 Level Category in Main Menu (on/off options). 3 Brands Display Variants – Logo / Name / Logo + Name – (on/off options). Contact Us Block (on/off options). Advanced Auto-adapting Grid System – set 2, 3, 4, 5, 6, 7 or 8 products in a row. The product images size automatically adapts to the number of products in a row. Swap Image effect (on/off options). Zoom Image effect (on/off options). Sale Badge – you can change the color. “Add to Wishlist” and “Add to Compare” links, zoom image effect, swap image effect, sale badge. 3 Hover effect – Shadow / Color / Shadow + Color. All elements in the product box can be aligned to the left or center (only grid view). Subcategory Wall or default OpenCart style. 10 Layouts of the Product Page. 3 Feature Boxes (on/off options). Related Products View – slider in right sidebar or bottom grid/slider. Custom Block in right sidebar (on/off options). Previous/Next navigation – you can navigate to previous or next product without going back to listing page. Increment/Decrement a Quantity (on/off options). Send to a Friend feature. Google Map with Pin Point (on/off options). 4 Feature Boxes (on/off options). About Us Block (on/off options). Follow Us Block – 18 Social Media icons (on/off options). Information Block (on/off options for each link). “Powered By” Block (on/off options). Payment Images – 15 payment images or custom (on/off options). Bottom Custom Block (on/off options). Custom Content Widget (left/right position). The ability to change the color of almost 180 items. Different Color Scheme for the Category Box, Filter Box, Left Column and Right Column. Unlimited Colors (ColorPicker for backgrounds, texts, links, headings, prices, buttons, main menu and much more). 276 included background patterns or upload your own. 75 included transparent background patterns which can be combined with any color. OXY Banner – Create an unlimited number of Banner Walls. OXY Custom Content Manager – Create an unlimited number of CSM Blocks and place the custom content in the left, right or main column. OXY Product Slider – Create an attractive Slider with featured products. Pop-Up Notifications with auto-close function. Categories accordion or default OpenCart categories style. “Scroll To Top” button (on/off options). The Multilanguage Support for all elements in the Theme Admin Panel.